n00b squad - "Super Smash Bros. 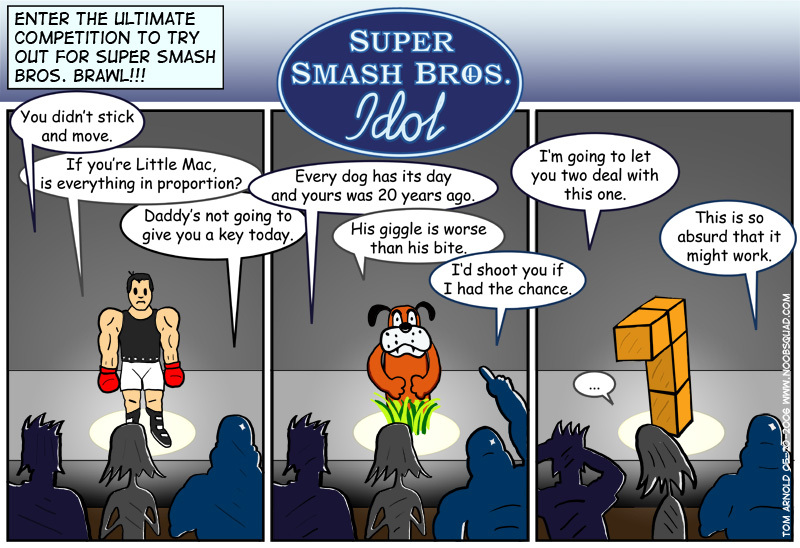 Idol"
The most impressive digital information that emerged from E3 was the Super Smash Bros. Brawl trailer. Nintendo once again tugged at the heart strings of the old fan boys with classic characters. To top if off, there’s a cross-over this time with Solid Snake as a playable character. SNAAAAKKKE out of all characters. That would mean he’s more playable then in his out cut-scene riddled titles. Apparently Hideo Kojima begged to have Snake included in the Gamecube realization of the series only to be denied because it was too late to add more characters. They had a five year buffer this time around. The extended trailer of Metal Gear Solid 4 had no gameplay whatsoever but MGS proves once again that one game can generate enough reason to buy a console. Some may be subdued by the $600 transfer of funds required to own a PS3 while other raving fans may not. With a 2007 release date, there’s no need to rush into a PS3 at launch. Mario Galaxy shattered my notion that Mario 64 could never be topped gameplay-wise. However, Mario Galaxy can be its true successor because it is not limited by gravity in the same way Mario 64 was. Mario now jumps to and fro on space junk. Every piece has its own gravity, enabling Mario to run around all surfaces as if they were mini-planets. The only potential fear I have is if the game relies on red coins like a certain not so sunny Mario and how deviously the coins could be hidden on the backsides of worlds. Currently appears to have huge potential to deliver as a Mario game should. On another note, Mario Strikers has some of the best multiplayer this generation while Mario Baseball will not be spoken of again due to a lack of runs compared to the competition. New site design's in place now. For many a year I have said I would get a new site design up and finally I buckled down and did it. You may notice there's standard features on the site now such as navigation between comics and a contact section. Right now there is an issue with comics wider than 800px not centering in IE and the border not stretching in Firefox. If you find a different issue with the site, feel free to send an e-mail (addresses to be found in the newfangled contact section).